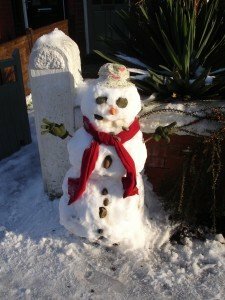 Frosty's in good shape despite a stony stare. Love the hat! Walking around in the snow lately I’ve been struck by the creativity it’s brought out in so many people. Our road has brought forth a great crop of traditional snowmen complete with carrot noses, scarves and other designer requisites, but the nearby Chorlton Meadows have been colonised by an impressive number of igloos, including one (reinforced with sticks) in the shape of a face with the mouth for entrance. It actually was quite warm inside. 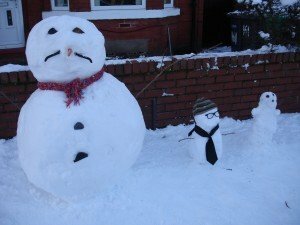 Brigadier Snowman and spectacled kid; is that a polar bear cub on the right? 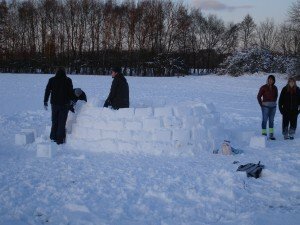 I’m pretty sure we didn’t have any igloos in the last big freeze. 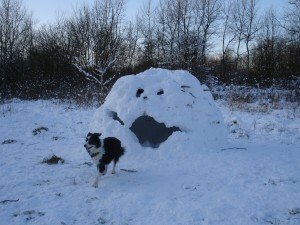 Maybe people are now more conscious of alternative building traditions – most people have seen a yurt, and know about eco-houses roofed with turf or built from hay-bales and so on. This must be a good sign. Humans are going to need to be resourceful as climate change takes a grip, whether it leaves us much hotter or much colder. Here’s to imaginative building!